Batting at things or tackling moving objects is normal behaviour for cats. If your cat pounces on you or other members of the household, she may just be bored and require more interactive playtime. However, unprovoked hissing, growling, scratching, and biting can indicate a problem. 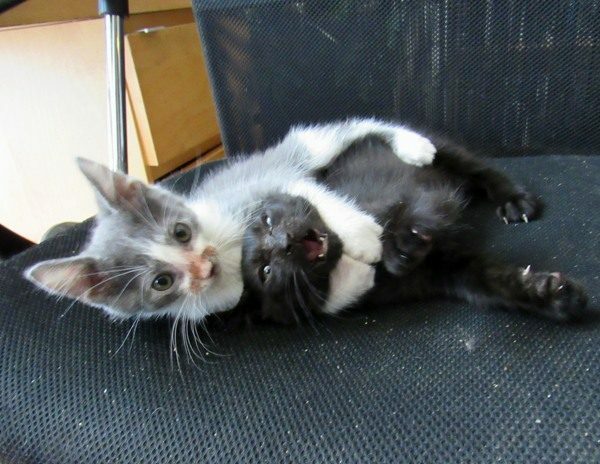 Cats may be aggressive because they were not properly socialized as kittens or because they have been mistreated. 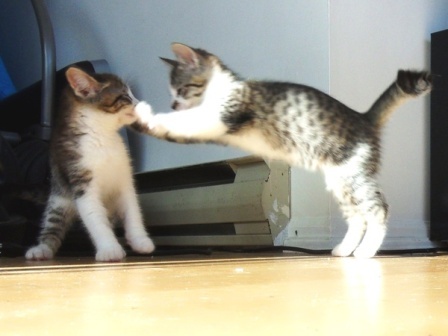 Some cats are aggressive because they have inherited the tendency from a parent, and sometimes people train their cats to be aggressive without realizing it. Encouraging a kitten to pounce on your feet and bite your toes or tackle your wiggling hands may be cute, but when an adult cat does this, someone might end up in the hospital with an infected bite wound. 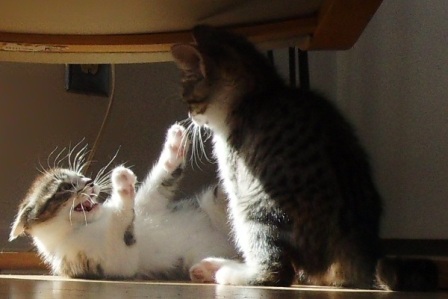 Cats may also become aggressive as a result of pain or anxiety. Bring your cat in for a veterinary check-up to rule out medical problems before attempting other treatments for aggression, particularly if a formerly mellow cat has become aggressive. Aggression toward smaller animals is a natural hunting behaviour, and it’s unreasonable to expect cats to curtail these tendencies. If you don’t want your cat to catch birds and mice, putting a noisy bell on her collar will reduce the likelihood of a successful hunt. Aggression toward larger animals is also natural. Cats are highly territorial, both toward their own species and animals of other species. Also, dogs are natural predators of cats in the wild, and many cats retain the instinct to defend themselves aggressively. This defense instinct may also be applied to people. If you have a cat that is attacking other pets or people in your home, there are treatment options available. There are strategies that can be used to help new pets grow comfortable with resident pets and vice versa. These include desensitization, conditioning, and reinforcement. Desensitization requires allowing the two animals to gradually become accustomed first to each other’s scent and then to the sight of one another. This can be done by feeding two cats on either side of a closed door or confining a dog with a baby gate to one portion of the house until the two animals are comfortable in each other’s presence. Conditioning is associating one thing with another. For example, if you provide your cat’s favourite food whenever she is in the same room as the animal or person to whom she is showing aggression, she will associate the presence of that individual with the positive experience of eating. When using this strategy, ensure that other people and animals keep a respectful distance and don’t bother the cat while she eats. Reinforcement involves providing rewards (which can be anything from verbal praise to pats to treats) when the cat curbs her aggressive response. When the cat is in a room with the person or animal that provokes her hostility, you can first calm her down by petting her and speaking in a soothing voice, and then offer the reward when she’s behaving calmly. There are anti-anxiety medications used to treat anxiety and aggression in cats. However, they should only be used as a last resort because they can have side effects and cats may become addicted to benzodiazepines. Medication is usually only given for a few months, though in some cases it’s required for more than a year. (Note: although cats respond to the same medications as those used to treat anxiety and depression in humans, they require much smaller amounts – a human-sized dose of medication can be lethal to a cat, so you should never give your cat medication unless recommended by a veterinarian). Punishment, physical or verbal, actually increases fear and aggression in cats, so it should be avoided. A cat that is punished in the presence of the animal or person to whom she shows aggression will associate that individual with the negative experience, and her hostility will increase. If your cat is scratching or biting, you can grab her gently by the scruff of the neck to pull her away and say “no,” but anything more forceful, such as hitting or shouting, will make the situation worse in the long term. Before trying any aggression treatments, consult a veterinarian, as medical issues may be causing or contributing to your cat’s aggression. Whiteley, E., Dr. (2008). 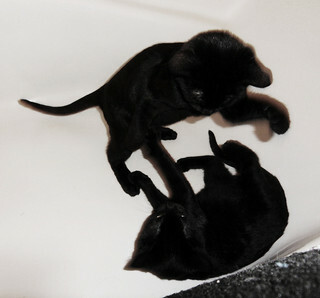 “How to Solve Cat Behaviour Problems.” HowStuffWorks.com.